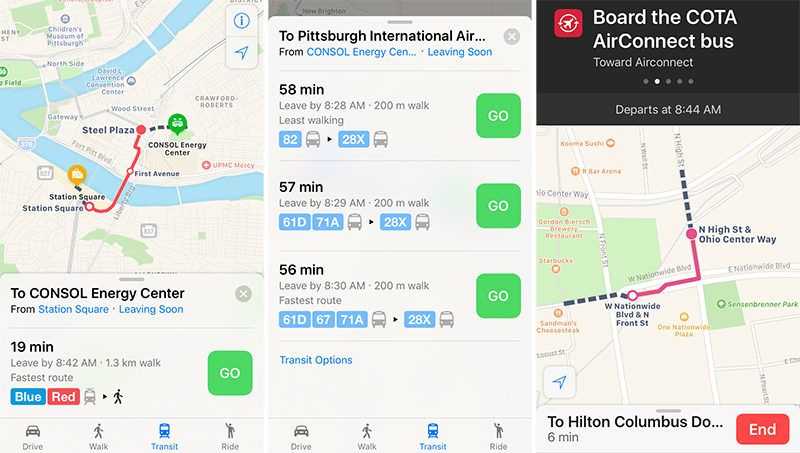 Apple Maps has been updated with comprehensive transit data for the U.S. cities of Columbus, Ohio and Pittsburgh, Pennsylvania, enabling iPhone users in the areas to navigate using public transportation, including buses or light rail. Transit routing options in the Pittsburgh metropolitan area include Port Authority of Allegheny County buses and light rail, while directions for Central Ohio Transit Authority buses are provided in the Columbus metropolitan area. Apple introduced Transit in Maps as part of iOS 9 in select cities around the world, including Baltimore, Berlin, Boston, Chicago, London, Los Angeles, Mexico City, New York, Philadelphia, San Francisco, Sydney, Toronto, and over 300 cities in China. The feature has its own tab in Apple Maps on iOS 10 when entering directions. The feature has since expanded to a number of regions around the world, including Atlanta, Dallas-Fort Worth, Denver, Honolulu, Kansas City, Miami, Montréal, Portland, Prague, Rio de Janeiro, Sacramento, San Antonio, San Diego, Seattle, parts of New South Wales in Australia, and parts of British Columbia in Canada. I know competition is good and all, but I kind of wish Apple would give it up already and allow users to select Google Maps as the default map program. Are you kidding? Apple will be launching its new base map in 2017 and already iPhone users are using it 5 BILLION times a week even though they can easily use Google or other map apps. Meanwhile, millions and millions of overworked, stressed and tired commuters have to make do with following the analog signs pointing to exit C, and manually figuring out whether their city has a tram or a light rail. COTA: To get home would take 2 hours 45 min. Why public transit just doesnt work for sprawling metros like Columbus. More like why public transit doesn't work for America. No, I'm not kidding. I've been using google maps for who knows how long and have a preference for its UI. What's a base map? Is Apple set to revamp their map app next year? The Apple maps app will be revamping in about an half-hour. About damn time for Pittsburgh! You already mention it, but choice is good. - Apple wanted turn-by-turn and vector map tiles, Google was holding these back as advantages for the Android platform. - In return for providing the features Apple (and iOS users) asked for, Google wanted more control over the Maps app, more branding, and more identifiable location data. Apple wouldn't budge. I'm glad Apple went down this path - privacy is important. It would've been easy to give Google access to iOS user data in return for the features. It might not have worked out the way they wanted to, but we now have a great Google maps app (with vector map tiles and turn-by-turn). And For those that want it privacy via Apple Maps (and in certain countries like mine - zeros issues maps wise. However points of interest, while improving, are still lacking). On the point of setting default apps - that's a whole different argument, and a decision that probably won't be changing soon. Columbus: "Your COTA is scheduled to arrive in 2 minutes." 10 minutes later it still won't be there. Horrendously ineffective buses. Their partnership with the Transit app for real-time tracking is pretty nice.